Buffalo Wings- 10 tasty wings served with celery sticks & your choice of dipping sauce! Loaded Breadsticks- Freshly made dough loaded with cheese & topped with the toppings of your choice. Perfectly paired with a delicious dipping sauce! 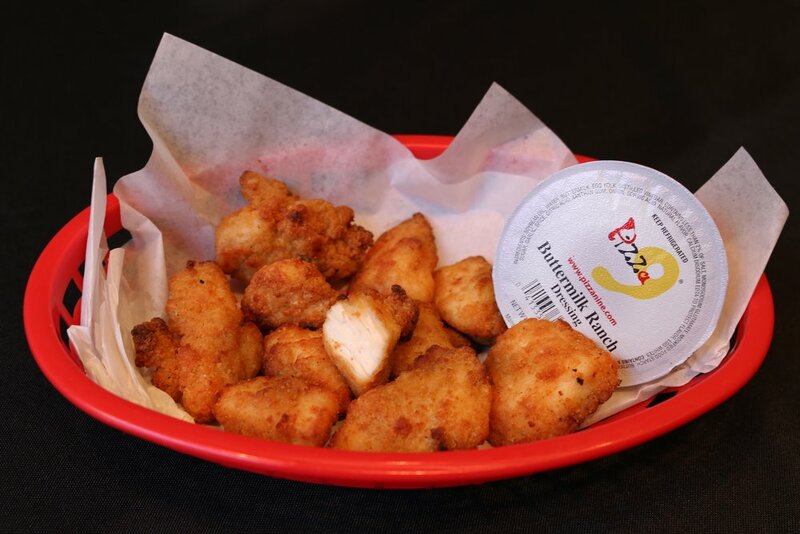 Chicken Bites- Tender breaded chicken prepared with a crispy outer coating, accompanied by a delicious dipping sauce! Half Garden Salad- A bed of fresh crisp romaine lettuce topped with tomatoes, cucumbers, carrots, an egg, bell peppers, red onions, cheese & croutons. Served with your choice of dressing! Specialty Salads- Upgrade your salad, add chicken, ham or pepperoni. Order one today! Half Garden Salad & Chicken Artichoke Florentine Soup-Soup & salad a wonderful combination, try one of our delicious stews today! Marinara & Alfredo sauce is available for all pastas. 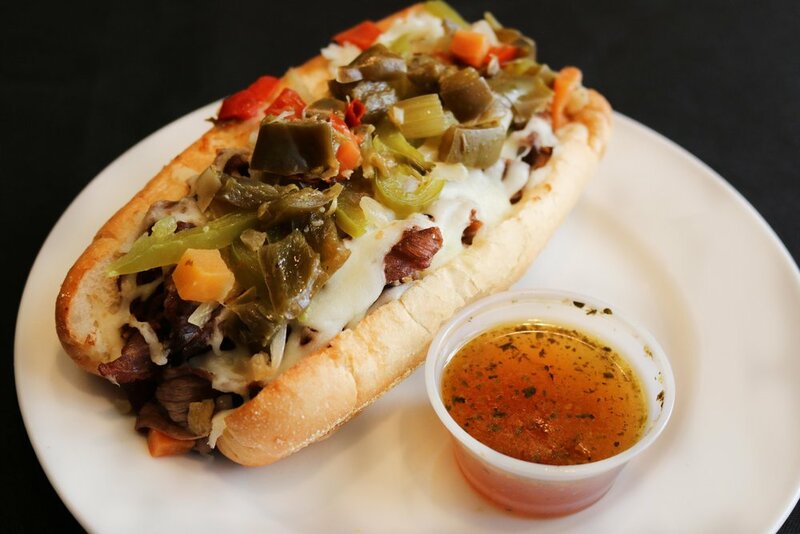 Beef & Sausage Combo Sandwich- A flavorful combination prepared with Chicago beef & Italian sausage, topped with onions, bell peppers, & giardineria. Served with a side of Au Jus. Veggie Delight Pizza & Italian sandwich- Our vegetarian pizza is topped with mushrooms, onions, bell peppers, black olives, & tomatoes. Can’t decide between pizza or sandwich? Spaghetti With Meatballs- Spaghetti noodles topped with marinara sauce, tasty meatballs & mozzarella cheese. Our Calzones are made with our Fresh 12” Deep Dish Dough, stuffed with Cheese and your choice of Pizza Toppings. Our Pizza Rolls are made with our Fresh 9" Deep Dish Dough, rolled with Cheese, Pizza Sauce, your choice of Toppings and served with a side of Ranch. 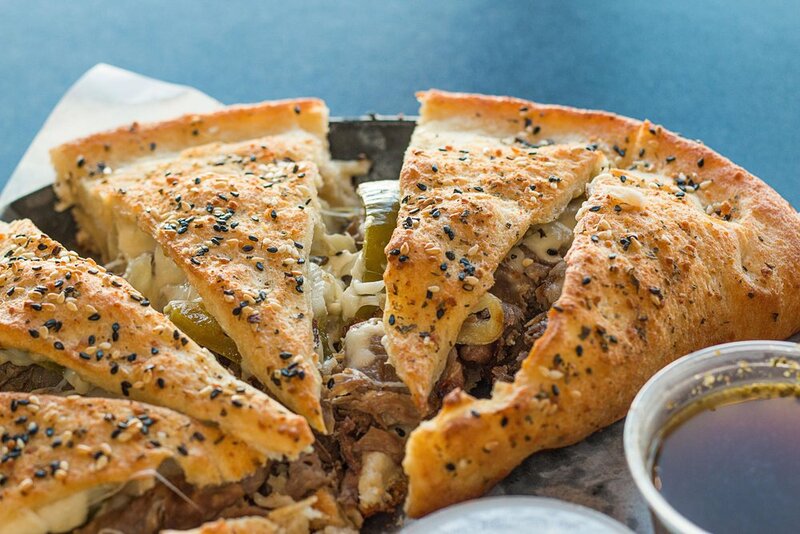 Chicago Beef Calzone- Prepared with our freshly made pizza dough then stuffed with Chicago-Style Beef, onions, bell peppers, cheese, & giardiniera. Served with 3 different dipping sauces! Pepperoni Pizza Roll & Chicago Beef Calzone- Both are delightful, try one today! Pepperoni Pizza Roll- Fresh pizza dough, rolled with our delicious pizza sauce, cheese & pepperoni. Served with a side of ranch. Green Chile Stuffed Crust-Soft, freshly made pizza crust stuffed with melted mozzarella cheese & green chilies. Back by popular demand, try one today! Deep Dish All Meat Pizza-Thick, freshly prepared pizza crust topped with 5 different meats. Including pepperoni, sausage, ham, ground beef and meatballs. Deep Dish Deluxe Pizza-Starts with our fresh daily prepared pizza dough, then topped with pepperoni, sausage, mushrooms, onions, bell peppers, & black olives. Deep Dish BBQ Chicken Pizza-Thick, freshly made pizza dough topped with barbecue sauce, chicken, & red onions. Thin Crust Capricciosa- Thin layer of pizza dough, topped with ham, mushrooms, black olives, & artichokes. Try one today! Cheesecake With Strawberry Topping-Rich chilled cheesecake topped with fresh strawberries and syrup. Add one to your next order! 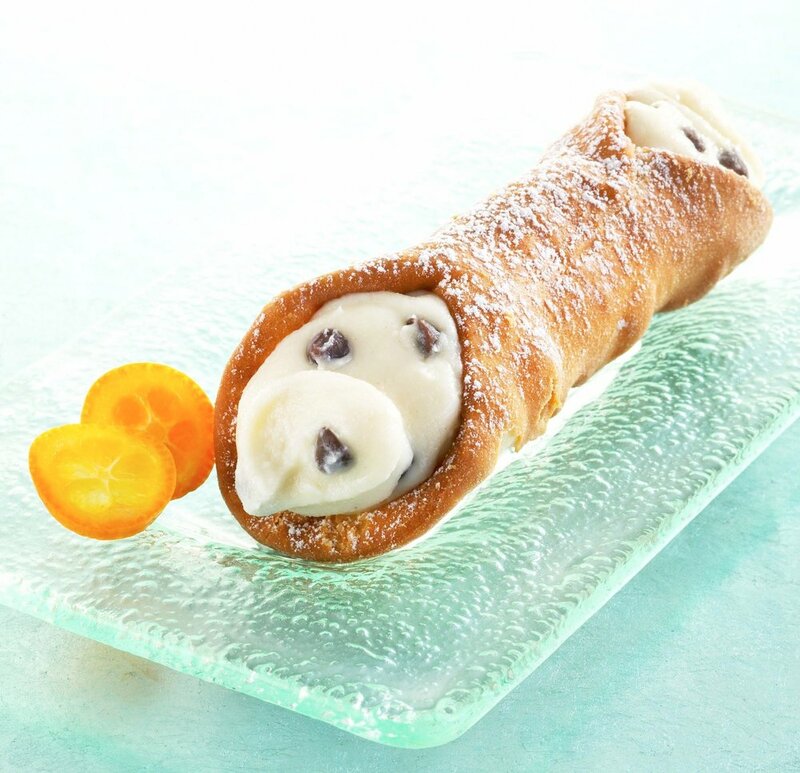 Cannoli- Delightful fried pastry filled with a sweet creamy ricotta cheese filling & chocolate chips! Pizza Brownie-Sweet, milk chocolate brownies baked with chocolate chip pieces. Add a dessert to your pizza order! 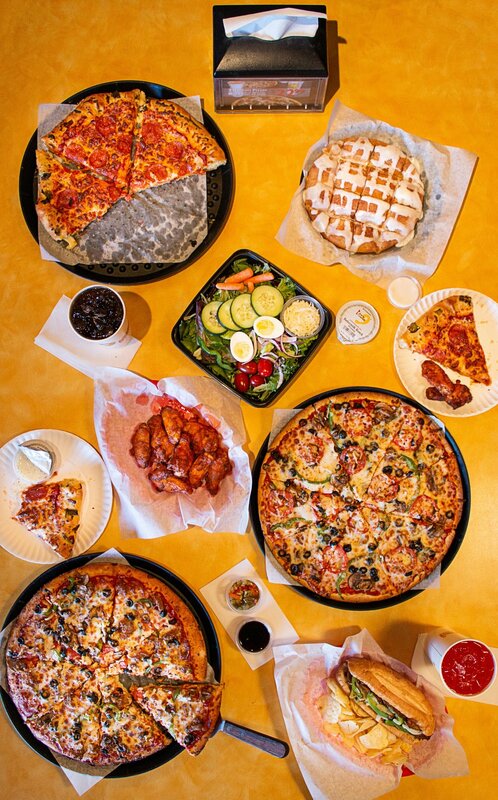 Pizza 9 Feast- Pizza, wings, salads, sandwiches…..you pick! Our menu has many options available! Pizza 9 Dinner- Party planning? Let us help! Check out our great party pack pizza deals! 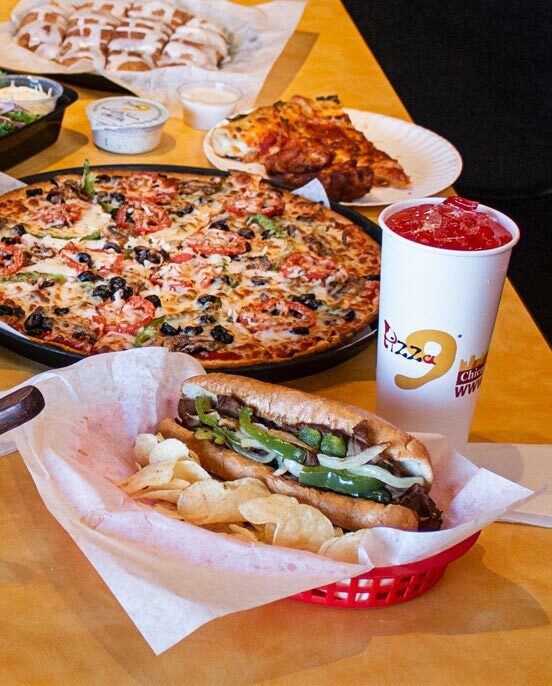 Pizza 9 Meal- Add a little variety to your meal, order now from your local Pizza 9 restaurant!